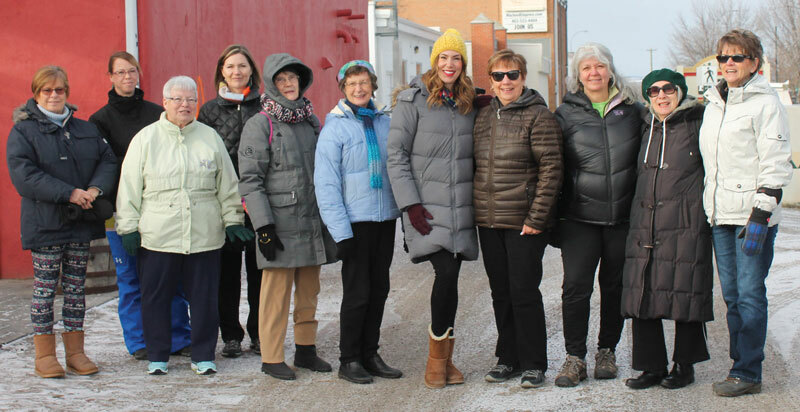 Fort Macleod put its best foot forward Wednesday for Winter Walk Day. Seven hundred and 74 people walked and then recorded their minutes with Family and Community Support Services director Angie O’Connor. 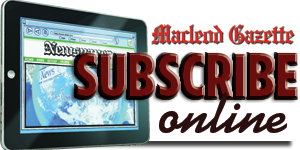 minutes logged by 410 Fort Macleod residents last year. “That’s an incredible difference,” O’Connor said. Held the first Wednesday of February every year, Winter Walk Day promotes the health benefits of walking. 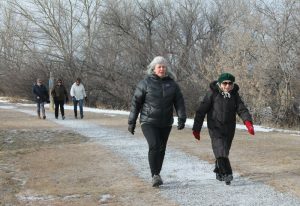 Fort Macleod was involved in a friendly Winter Walk Day challenge with the Town of Drumheller. Drumheller won the challenge with 1,178 participants who recorded 35,126 minutes of movement. Since Drumheller had the most participants, O’Connor will have to drape herself in a Canadian flag and buy and hand out 150 Timbits from Tim Hortons. And since Drumheller recorded the most minutes walked, O’Connor will have to drape herself in a Canadian flag and sing O Canada at the Town Office. Fort Macleod responded to the challenge, with students and staff at both W.A. Day and F.P. Walshe schools recording their minutes. “The schools always get behind it, which is really nice,” O’Connor said. Also supporting Winter Walk Day were patients and staff at Extendicare, Kids First Family Centre, Hand In Hand Out of School Care, day homes, Third Wave Fitness members, the adult walking group at the community hall, and the ladies walking group. People in Fort Macleod are also growing familiar with Winter Walk Day and are anticipating the event.